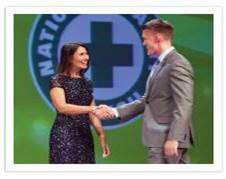 The National Safety Council recognizes outstanding achievements through the Green Cross for Safety Awards. Nominees and recipients demonstrate significant advancement or improvement of safety in the workplace, in transportation, and in homes and communities. If you have any additional questions, or would like to speak to someone immediately, please call (630) 775-2124 or email sandy.wolfrum@nsc.org. I would like to receive information about the Green Cross Awards.